US Fighters Pose Security Risk on Return From Syria. The State Department says it has no estimates of how many Americans have taken up weapons to fight military units loyal to Syrian President Bashar Assad in the conflict that has killed more than 100,000 people over 2 ½ years. Other estimates — from an arm of the British defense consultant IHS Jane’s and from experts at a nonprofit think tank in London — put the number of Americans at a couple dozen. The IHS group says al-Qaida-linked fighters number about 15,000, with total anti-Assad force at 100,000 or more. This year, at least three Americans have been charged with planning to fight beside Jabhat al-Nusrah — a radical Islamic organization that the U.S. considers a foreign terrorist group — against Assad. The most recent case involves a Pakistan-born North Carolina man arrested on his way to Lebanon. Current FBI Director James Comey said this month that he worried about Syria becoming a repeat of Afghanistan in the 1980s, after the Soviet invasion, with foreign fighters attracted there to train. The FBI refused to say whether it has directed agents to increase efforts to stop Americans bound for Syria. Sheikh said he backed out because “he could not muster the strength to leave his parents,” the affidavit said. Sheikh said he had traveled to Turkey last year hoping to join the fight in Syria, but became dispirited by his experience with people who claimed to be part of the U.S.-backed Free Syrian Army. After Sheikh expressed online support for Jabhat al-Nusrah and interest in traveling to the war zone, the FBI employee suggested Sheikh contact a person with the group — another FBI informant. An Interim Choice for Syria. In the northeastern part of Syria — contiguous to Iraq and Turkey — lies al-Hasaka or the Triangle, also known as al-Jazeera province. As large as Lebanon, this area is inhabited by roughly four million Kurds, one million Christians and a half million Arabs. Assad forces have practically left the area, and Kurdish militias have set up patrols, stopping al-Qaida militias trying to enter these districts. This region should be the foundation for a free Syria. Here we should nurture a free zone inside Syria with the potential to grow rapidly and defeat both the Assad regime and the Jihadists. With U.S. and western help, the Kurds, Christians, and Arabs who populate this region can establish a liberated zone with its cities, rivers and expanded airports that should serve as the receiving area for aid. The current Free Syrian Army and other opposition groups can be invited to join in this region. This pluralist “smaller Syria” would become the basis for liberation of the country — and the establishment of a pluralistic and peaceful society for all Syrians. I would argue this is no more unrealistic than the hope that Vladimir Putin and the Russians will broker an honest peace in Syria. In fact, if you examine the three current Beltway solutions to the Syrian crisis, we should recognize why turning to this plan will offer a real, long-term hope for a pluralistic and peaceful Syria. President Obama has made the case for a “limited strike” against Assad and the forces who are presumed responsible for the horrible chemical gassing of more than a thousand civilians — after more than 100,000 Syrians have already been brutally killed in the civil war. The president wanted this limited strike to force a weakened Assad to negotiate a settlement to the conflict. But seasoned observers know there will be no mediated solutions to this conflict. It has gone too far and divisions are too deep. I would also argue that other Beltway solutions offer no more hope than those offered by Obama. The isolationist argument is to simply allow both sides to fight it out because America has no horse in this race. “Let Allah sort it out,” says Sarah Palin. This “safe option” is incredibly dangerous. If there are two radical forces — those of Assad and al-Qaida — in the game, each will receive more reinforcements and eventually settle their battles via some Islamist medication — or worse still, a manufactured war with Israel. Even if that war is avoided, we will be left with two extremist and heavily-armed terror groups in Syria. Another option put forward by Republican Sen. John McCain of Arizona is equally dangerous. He wants to fully arm the rebels in an attempt at toppling Assad. The naïveté of this choice is that it can be manipulated by Islamist lobbies who will redirect U.S. assistance to their radical brethren inside the opposition, instead of to secular forces. This could end up empowering al-Qaida and producing future Benghazi-like attacks in Syria. Meanwhile, all of these positions could lead to war with Iran and Hezbollah or, in view of this administration’s natural tendency toward retreat, could culminate in another victory for radicals. That is why I suggest a practical, but irreversibly winning option for the creation of a free Syria. We have in this region a group of vetted allies in place and al-Qaida and the Nusra Front contained. We have a region in which the Assad regime is not omnipresent. Those in the U.S. who are concerned about aiding two menacing forces can partner in the al-Hasaka region with free and independent Kurds, Christians and Arabs. Those who want to arm the rebels will have an area ready to be supported. If the administration wishes to conduct punitive raids against regime targets without aiding al-Qaida, it can, over time, empower the real allies to move forward from this particular zone. The development of a free Syria is the most viable option for the United States, Europe and the rest of the international community. This is where endangered minorities can be protected and joined with liberals and secular members of the Arab Sunni majority. The United States and Russia have been attempting to find negotiated solutions to the chemical weapons crisis, and have declared that they reached a compromise. Assad is supposed to allow the UN to move in and dismantle the weapons of mass destruction and the opposition is supposed to accept the deal. The latter rejected the deal because it keeps Assad untouched. The Russians state they will pressure the dictator but only if the opposition recognizes his role at the Geneva talks. In addition, it is less likely the Jihadists of al-Nusra would go along, and not likely that Moscow would accept a Chapter 7 resolution targeting its ally in Damascus. It is also unlikely that the Obama Administration will transform any limited strike into a regime changer campaign, for fear of clashing with the Iranians and Hezbollah. The bottom line is clear: Putin and Obama are not partners on ending Syria’s ordeal. They are producing a pause to find another status quo after Assad breached it with the use of chemical weapons in August. The war will go on, and what is needed is a game changer on the ground. The third option we’re proposing is the most efficient way to free more Syrians and weaken both Assad and al-Qaida. Syrians yearn for freedom. Americans yearn for effective foreign policy. Let’s start building toward that end. McCain: Syrian Deal with Russia is ‘Meaningless’. The deal between the United States and Russia on Syria’s chemical weapons is “meaningless,” Sen. John McCain said Monday. It erodes America’s credibility in the Middle East and will ultimately be unenforceable, he said. “It’s clear we’ve bought into [this] idea that Vladimir Putin and Bashar Assad are serious about real dismantlement of these chemical weapons when there is no penalty in the United Nations Security Council for failure to comply,” The Arizona Republican said on CNN. The deal, McCain said, gives Putin “a major place in the Middle East,” while giving the Assad regime a green light to continue to escalate attacks on the Free Syrian Army rebels fighting to overthrow him. “Two years ago, the president said Bashar al-Assad must go. If anything, this ensures he stays in power,” McCain said. The United States, McCain said, has lost all credibility in the Middle East by saying Syria crossed the “red line” in its use of chemical weapons yet failing to retaliate with military action. “The Iranians, Israelis, and North Koreans will take a lesson from this,” he said. Lebanese Paper: Syria Has Moved Chemical Weapons Materials To Iraq. Syria last week moved 20 trucks carrying material and equipment used to manufacture chemical weapons into neighboring Iraq, the Lebanese daily Al-Mustaqbal reports. The Al-Mustaqbal report, which was picked up by the Jerusalem Post, came just a day after Washington and Moscow struck a deal stipulating that Syrian President Bashar Assad‘s regime should destroy its chemical arsenal to avert an American military assault. Al-Mustaqbal reported the trucks crossed the Iraq-Syria border Thursday and Friday. Border guards did not inspect their contents, raising suspicions the trucks contained illicit cargo, according to the newspaper. Al-Mustaqbal, a publication that has long been affiliated with anti-Syrian political elements in Lebanon, quoted a denial from Iraqi Interior Ministry spokesman Saad Maan. Maan said security forces were deployed along the border and were checking all vehicles coming into the country. Last week, the head of the Free Syrian Army, which is fighting to topple the Assad regime, told CNN that opposition intelligence indicated Damascus was moving chemical arms out of the country. “Today, we have information that the regime began to move chemical materials and chemical weapons to Lebanon and to Iraq,” Gen. Salim Idriss claimed. Idriss said the rebels were not interested in the new U.S.-Russian deal over Assad’s chemical-weapons arsenal. 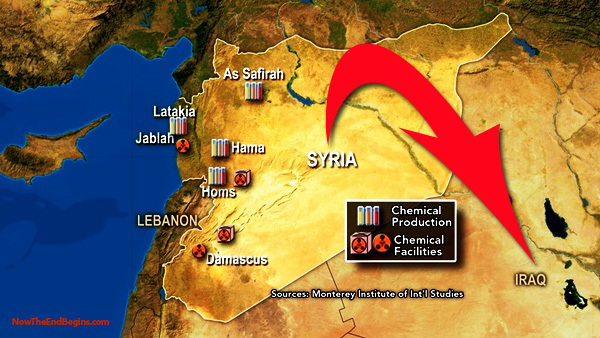 BREAKING: While Obama Sleeps, Syria Moves Chemical Weapons To Iraq. Syria has moved 20 trucks worth of equipment and material used for the manufacturing of chemical weapons into neighboring Iraq, the Lebanese daily Al-Mustaqbal reported on Sunday. The government in Baghdad has denied allegations that it is helping the Syrian government conceal chemical stockpiles. The report came just a day after the United States and Russia struck a deal stipulating that Syrian President Bashar Assad’s regime would destroy its chemical arsenal to avert an American military assault. The newspaper reported that the trucks crossed the boundary separating Syria with Iraq over the course of Thursday and Friday. Border guards did not inspect the contents of the trucks, which raises suspicions that they contained illicit cargo, according to Al-Mustaqbal. Al-Mustaqbal, a publication that has long been affiliated with anti-Syrian political elements in Lebanon, quoted a spokesperson for Iraq’s interior ministry, Saad Maan, as saying that security forces were deployed along the border and were checking all vehicles coming into the country. “These accusations are all rumors and are useless and no one believes them,” he said. Last week, the head of the Free Syrian Army told CNN that opposition intelligence indicated Assad was moving chemical arms out of the country. “Today, we have information that the regime began to move chemical materials and chemical weapons to Lebanon and to Iraq,” General Salim Idriss told CNN. “We have told our friends that the regime has begun moving a part of its chemical weapons arsenal to Lebanon and Iraq. We told them do not be fooled,” Idris told reporters in Istanbul. McCain: Rebels Fighting Assad Feel Abandoned by US. Sen. John McCain says the cause of rebels fighting Syria’s President Bashar Assad has been obscured in the rapid-fire military and diplomatic events following a chemical weapons attack near Damascus. One of the persistent questions about U.S. policy in war-ravaged Syria is to what extent the terrorist network al-Qaida is involved in the efforts to end Assad’s rule. McCain said President Barack Obama should have acted more forcefully against Assad many months ago.